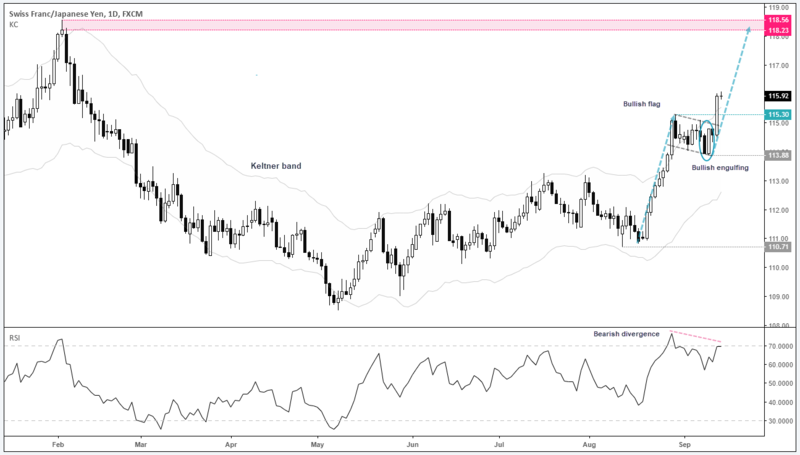 On the 6th September we analysed CHF/JPY’s potential to move higher. With yesterday’s explosive break to new highs, we doubt the move is done yet. After its most bullish session in 14-months, CHF/JPY sits at its highest level since February and the 2018 high is now within easier reach. In fact, if it were to provide another couple of sessions like yesterday it would overshoot this target, given the 2018 high is only around 250 pips away and yesterday’s range was 150 pips. Still, keeping in mind prices have now moved beyond the upper Keltner band and the RSI is displaying a bearish divergence, we doubt it will simply go up in a straight line. But the bias remains bullish overall. A bullish engulfing candle, which is part of a bullish piercing pattern marks 113.88 as a key structural level. And the break to a new cycle high confirmed a bullish flag breakout which generates an approximate target just below 120. Interestingly, if we take a more conservative approach to measure the target (by projecting from the 113.88 low instead of the 115.30 breakout level) the target sits right near the 2018 highs which makes it a more sensible target. As the move is potentially overextended for the near-term we’re on the lookout for a retracement and will avoid chasing the trade after such a large move. As we transition over to next week, 115.30 may provide support and hopefully allow us to position ourselves for a lower volatility, higher probability entry.